To commemorate 25 years of service, each month this year the Armenian EyeCare Project is featuring a key element of our organization that has allowed us to bring eye care to the people of Armenia. Last month, we shared the story of our first AECP fellows — four physicians in Armenia selected by our organization to study ophthalmology abroad and return to Armenia to open subspecialty clinics. This month, we share the story of our Mobile Eye Hospital, a state-of-the-art surgical suite on wheels that travels throughout Armenia to provide eye care. The idea for the Mobile Eye Hospital began during the summer of 1998 — our 12th Medical Mission to Armenia. EyeCare Project physicians discussed how their work in Yerevan, Armenia’s capital, could be expanded to serve people living in other regions throughout the country. At the same time, our Fellowship program was already underway and it was expected that our Fellows — the top ophthalmologists in the country — would return to Armenia following their fellowships and, as directors, launch subspecialty clinics at the Malayan Ophthalmological Center in Yerevan. Armenians living in Yerevan — or those who could easily travel there — would receive care. 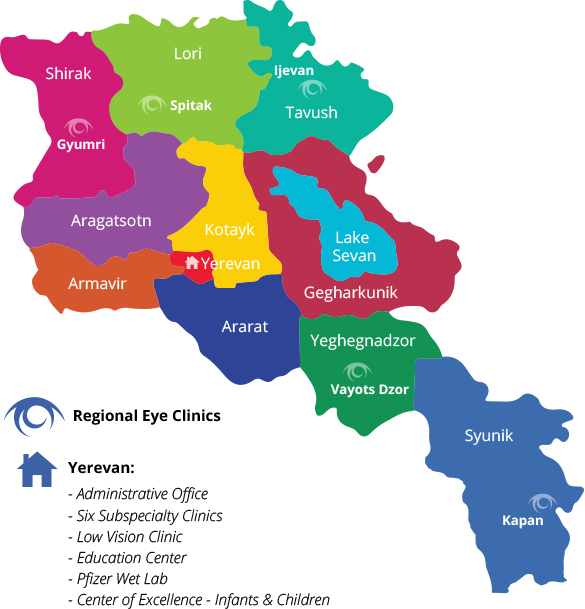 But Armenians living in other regions of Armenia, especially those who could not afford to travel to Yerevan, still needed access to quality eye care. Dr. Alex Malayan, the Chief Ophthalmologist of Armenia and Director of the Malayan Ophthalmological Center, EyeCare Project Founder Dr. Roger Ohanesian, Dr. Rick Hill and other physicians who worked closely with the Project discussed methods of providing eye care in Armenia’s rural villages. They agreed that the best way to get quality care to all Armenians, not just the people in Yerevan, would be a “hospital-on-wheels” — an eye hospital that traveled to them. In 2002, the holidays arrived early for the people living in the rural villages of Armenia. 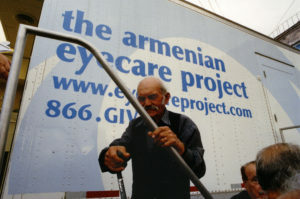 After traveling by boat, all the way from Vermont, the Mobile Eye Hospital (MEH) reached its destination in Yerevan on November 6, 2002. The 14-ton, 408-square-foot mobile clinic was the culmination of the efforts of more than 1,000 EyeCare Project volunteers and donors. For the last 15 years, the Mobile Eye Hospital has made 21st Century eye care available where it is needed most in Armenia. 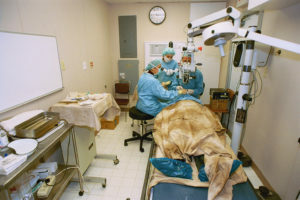 With a state-of-the-art operating room and two well-equipped examination rooms, the Mobile Eye Hospital is a fully functioning surgical suite on wheels. Outfitted with the latest eye care equipment, the MEH features two cutting-edge lasers — one for exams and another for surgery — and includes integrated systems for telemedicine as well as a comprehensive medical gas system, nurse call system and data management system. In the small space, there is also a lavatory, a utility room and a “clean and dirty” room with a microwave, sterilizer, sink and refrigerator. Designed to travel throughout Armenia, including the remote countryside villages, the Mobile Eye Hospital delivers eye care to approximately 35,000 Armenians each year who are unable to travel to the capital city. These Armenians receive basic eye care, including annual screenings for glaucoma and eyeglasses, as well as more advanced care, like surgeries for cataract and other eye disorders. To date, over 15,000 surgeries have been performed aboard the Mobile Eye Hospital and more than 70,000 eyeglasses distributed. Understanding that we can only make a sustainable difference in Armenia through advanced medical training and education for Armenia’s physicians, all of the doctors and nurses working on the Mobile Eye Hospital are local Armenians who have been trained by the EyeCare Project. Among them is Dr. Asatur Hovsepyan, who directs all activities on the MEH and performs most of the surgeries aboard the mobile clinic. While Dr. Hovsepyan performs the majority of the surgeries on the MEH, local physicians practicing in the towns the Mobile Eye Hospital visits also use the mobile clinic as a facility for advanced training. 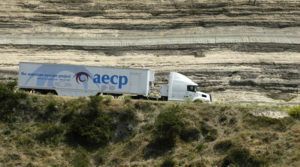 The Project enables doctors in local towns and villages to observe the work of AECP-trained ophthalmologists aboard the Mobile Eye Hospital while they are performing surgery. Additionally, through the Project’s telesurgery program, local doctors can connect to expert ophthalmologists in Yerevan via satellite. With our telemedicine capabilities on the Mobile Eye Hospital we have the ability to connect in real time with one of the leading eye hospitals in Yerevan, the Malayan Ophthalmological Center. Local physicians in villages and small towns participate in mentorships, observe surgery techniques and are exposed to modern medicine while remaining in their village with near-primitive facilities. Making a full rotation throughout Armenia every two years, the MEH travels to communities where conditions are most critical. Those who meet the government-designated “socially vulnerable” standard are scheduled to be seen first on the Mobile Eye Hospital for initial screening and, if required, advanced care — all at no cost. In addition to traveling throughout Armenia, the Mobile Eye Hospital also visits orphanages, nursing homes and shelters in Yerevan to offer eye care to thousands of disadvantaged children, adults and elderly Armenians. Blindness is a terrible fate, yet more than 80 percent of all cases can be prevented or treated, resulting in the restoration of sight. Through our Mobile Eye Hospital, we work to combat the unacceptably high rate of blindness and eye disease in Armenia and aim to reach those less-fortunate Armenians, both living outside of Yerevan and in it, who have never seen an eye care specialist. Time is a critical factor in treating eye disease, especially in children, and our EyeCare Project physicians are determined not to miss the narrow window of opportunity to save an Armenian from blindness. By screening these patients — children, adults and the elderly — aboard our Mobile Eye Hospital, we can detect if there is a problem and save their sight. 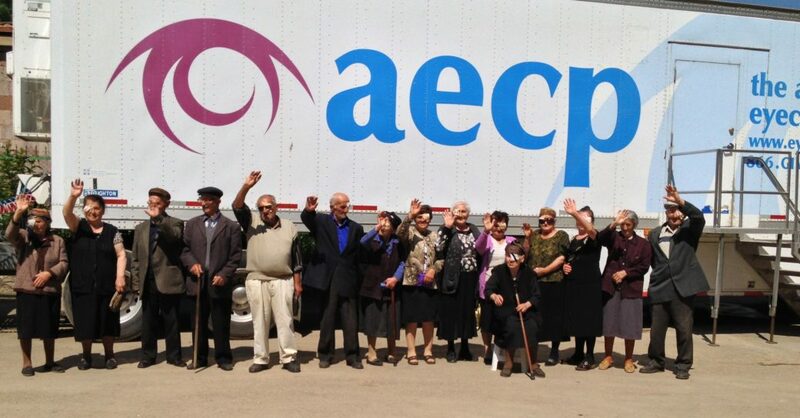 If not for the Mobile Eye Hospital, these Armenians would likely go their entire lives without seeing an eye care specialist and having their sight restored.